This triangle bus stop at the intersection of S. Kinnickinnic Ave., E. Lincoln Ave. and S. Howell Ave. in Bay View was originally deemed a beautification project. Some critics and neighborhood residents would object to such a term. 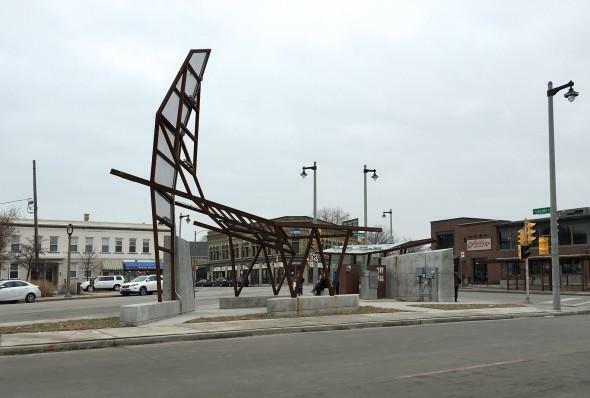 But two more recent projects have raised the hackles of UrbanMilwaukee's art and architecture critic Tom Bamberger - the Bay View bus stop and a swing park under the Holton Street Bridge. The greater issue is the idea of creative placemaking. One of the critiques of the bold bus stop is that it includes no seating. And the swing park has attracted criticism for its lack of oversight. "What really unites both cases is: they're lies...these are both incredibly crude amateurish first drafts. And they're lies in the sense that they pose as authentic real things. They're not really trying, it's just a pretend," Bamberger says. "Art is not the solution to any problem. Art in the twentieth century is a question. It's not something you can add like MSG to a soup. You can't 'soup up' things with art. Sure, I'm for good art, but what we're talking about here really isn't art, it's talking about having pride," he adds. Milwaukee’s art scene is not restricted to hushed galleries. We slip in along the major traffic artery to capture a temporary art installation in progress - Art on Fond du Lac.